Now that the new school year is well underway, parents are starting to assess how these first few months have gone and what they bode for the remainder of the term. What’s the classroom teacher like? Will my child get good grades? Has she made new friends? Is she safe? Is my child looking forward to school every day, or is it a daily struggle to get him there? One question parents probably aren’t asking themselves is: “What kind of recess is happening at my child’s school?” No, that question is usually not top of mind. But there’s a good chance it should be. In 1996, Jill Vialet was sitting across from a principal of an elementary school in Oakland. The principal looked haggard, emerging from an earlier meeting trailed by three 5th grade boys. The principal launched into a tirade about… recess. She was tired of seeing the same kids in her office every day, hauled in for fighting on the playground. These weren’t bad kids, the principal insisted. They just were using their powers unwisely on the playground. Meanwhile, her teachers looked for any excuse — sometimes literally hiding — to avoid recess so they wouldn’t have to confront the inevitable outbreak of chaos. Shortly after that meeting, Vialet founded Sports4Kids, now Playworks. 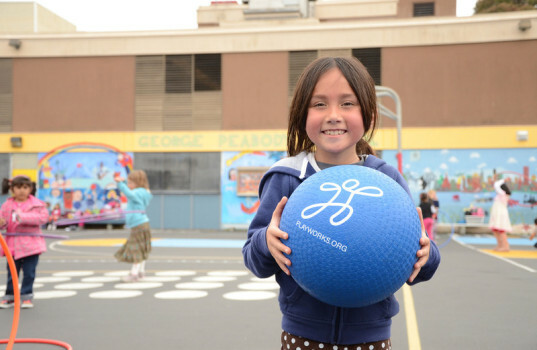 Our goal: transform recess and the school day with safe and healthy play so teachers can teach and kids can learn. Today, Playworks is the leading national nonprofit leveraging the power of during- and after-school to transform children’s physical and emotional health, serving more than 900 schools in 23 cities, and reaches approximately 425,000 students directly and through professional training services. Playworks Southern California serves 35 schools LA and Orange County (6 in Santa Ana), and reaches approximately 31,889 students every day. The fact is, a school’s recess period is a critical part of the school day. It can have a significant impact – good or bad – on a school’s climate and on how a child feels about school overall. A recess that’s filled with chaos and conflict, with fighting and bullying behavior, can leave children frustrated, upset and unable to concentrate on classwork. On the other hand, a healthy recess – one where every kid gets to play, rules are followed and children feel safe and included – can send students back to class happy, refreshed and ready to learn. Unfortunately, recess in many schools has turned into the most difficult part of the day. Statistically, most discipline and injury reports happen following recess. But that doesn’t have to be the case. At Playworks, we have seen firsthand that recess can be transformed from a period of concern to one where kids can thrive. Furthermore, the life skills that children learn and the experiences they have during a great recess can help them off the playground as well. When kids learn how to work as a team, resolve minor conflicts amicably, play fair and be empathetic, they are more likely to work well with other students and have confidence in their ability to succeed. • Do students at your child’s elementary school have a daily recess period? Students should have at least 20 minutes of recess each and every day. • Do all kids feel included? Chances are kids who are on the sidelines are there because they don’t feel comfortable or welcomed on the playground, or may experience bullying when they do try to get involved. • Do students have a common set of rules to follow? When kids and adults don’t have an agreed-upon set of rules, arguments break out and escalate into crying or even physical fighting. • Do kids solve their own conflicts? Students should learn simple techniques to resolve minor disputes that arise, such as whether a ball was “in” or “out.” Rock-Paper-Scissors is our problem-solving tool of choice. • Are there active adults on the playground trained to facilitate recess? Recess staff should be trained on play and group-management techniques and should engage with students, teaching them a variety of games so that every child gets to play. • Does your child’s school withhold recess as punishment? The American Academy of Pediatrics states that recess is a crucial part of the school day and shouldn’t be taken away to punish any child. LaVal Brewer is the executive director of Playworks Southern California and Eric Stockel is the organization’s board chairperson. More information about how to identify a great recess can be found at www.playworks.org/ask-about-recess.